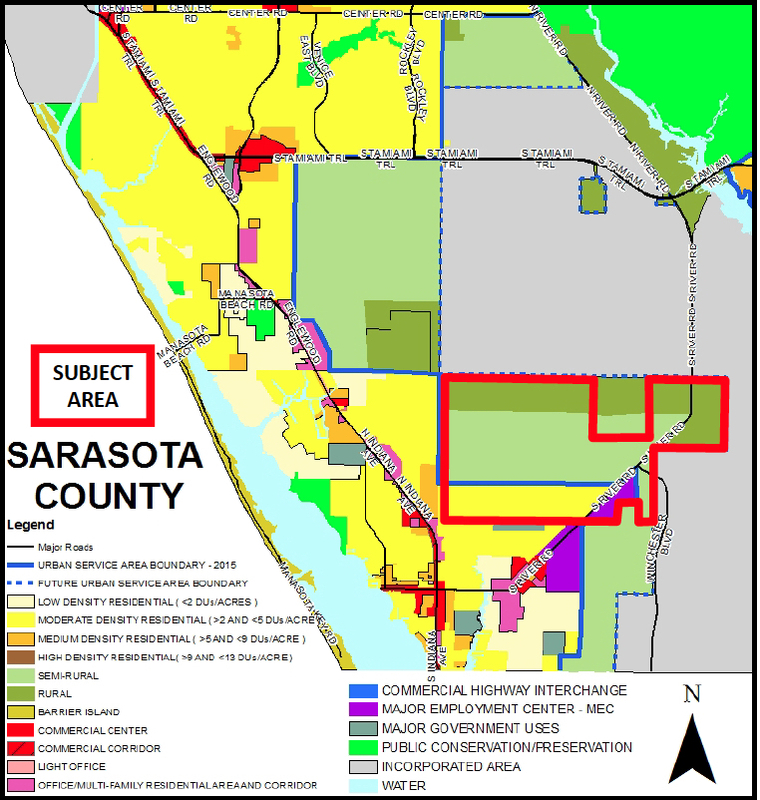 On Dec. 8, 2015, the Sarasota County Commission voted unanimously to approve two Future Land Use policies as the first step in a process designed to lead to the construction of about 10,600 new homes in the West Villages in South County. Constructing that complex has been the focus of collaboration among the Braves, the West Villages Public Improvement District, the county and the City of North Port, with the parties last year signing specific agreements to conclude the deal. On Sept. 11, Black formally was seeking County Commission approval of the boundary and scope of work for a Critical Area Plan (CAP) designed to lead to the new residential areas southeast and northwest of River Road. With a unanimous vote on a motion by Commissioner Alan Maio, seconded by Commissioner Michael Moran, Black won that approval. The owner of the approximately 3,660 acres is Winchester Florida Ranch LLC. 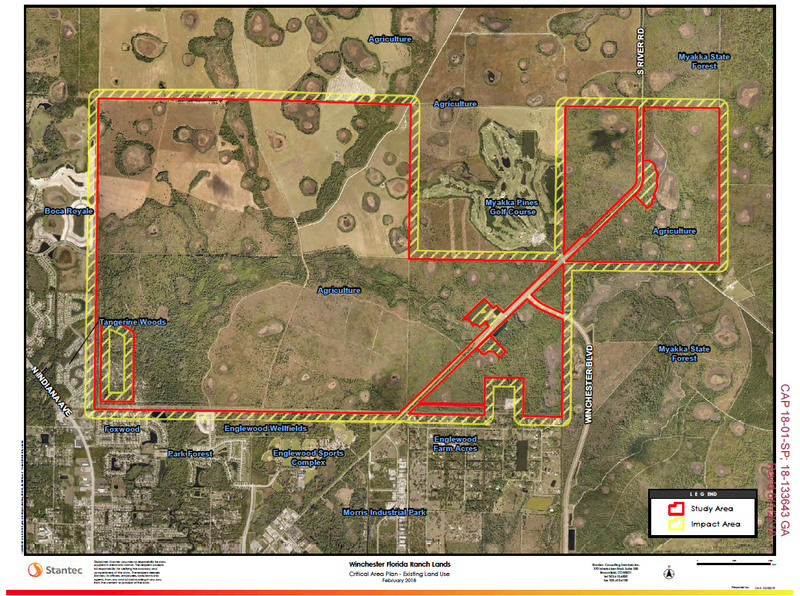 According to a map provided by Stantec, the Sarasota consulting firm that is part of the project team, the CAP area lies east of Boca Royale; north of the Englewood Sports Complex and the Englewood Wellfields; and west of Myakka State Forest. The Myakka Pines Golf Course is carved out of the area. 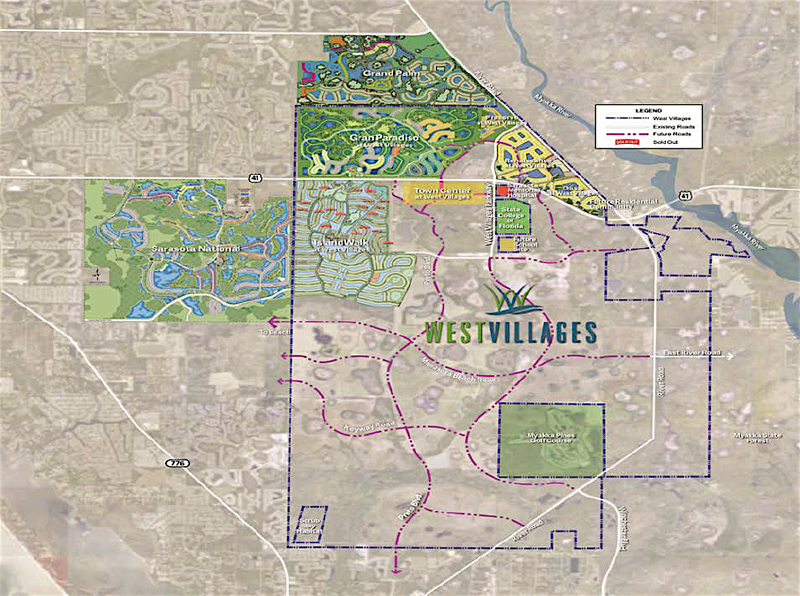 The CAP application notes that the property is bound by the West Villages and the City of North Port to the north and east. Additionally, the project team has been focused on the transportation needs of the future residents, Black told the commissioners. As a result of that planning, he said, the county may not have to invest in the widening of River Road south of U.S. 41. During his presentation to the board, county Planner Steve Kirk explained that part of the acreage proposed for the CAP area is zoned Rural and Semi-Rural. 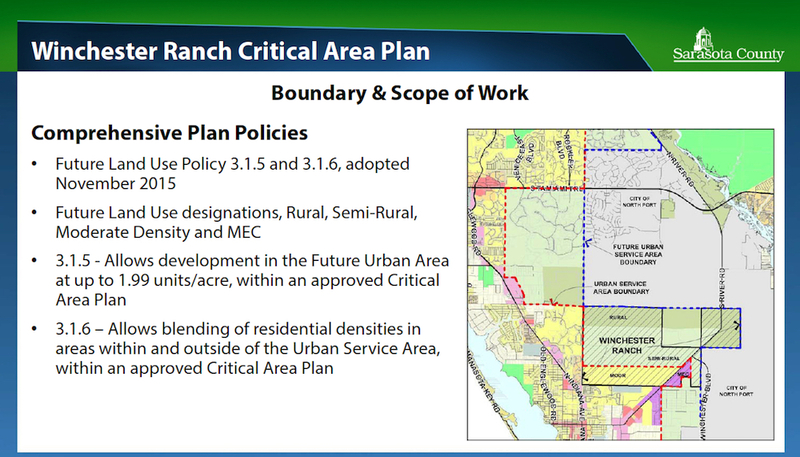 Those designations limit density to 0.2 and 0.5 dwelling units per acre, respectively, Winchester Ranch’s 2015 application noted. As a result of the Dec. 8, 2015 commission vote, Future Land Use policies would permit the development of up to 1.99 units per acre in both parts of the property. However, to achieve that new density, the commission also would have to approve the CAP proposal and then the rezoning of the area. The proposed boundary for the project would encompass about 3,860 acres, Kirk noted, including 108 acres in four county-owned parcels. Part of that county land is dedicated for protection of gopher tortoise and scrub jay habitat, Black explained. The rest of the county acreage, Kirk said, comprises areas for stormwater management or environmental mitigation. All the properties associated with the CAP application “are located within the unincorporated portion of the West Villages Improvement District, and are under common ownership and control,” the application points out. About 78% of them are located within the county’s Future Urban Service Area. In response to a question posed by Chair Nancy Detert, Planner Kirk said he expected the CAP analysis to take several months. After it has been completed and provided to county staff for review, Kirk continued, it probably would be another six to eight weeks before the county’s Planning Commission would conduct the first public hearing on the CAP petition. Then he anticipated the earliest the County Commission would hold its public hearing would be six weeks after the Planning Commission session. “At a minimum, roughly, four to six months,” Commissioner Alan Maio summed up the timeline. Kirk told him six months would be more likely the case. If the CAP wins final approval, Kirk explained, the property still would have to be rezoned to support the development proposed by the project team. A rezoning petition can be handled concurrently with the CAP process, he added. When Detert then asked how many people were notified in advance of the hearing that day, Black told her that slightly more than 1,000 property owners were mailed cards. For the CAP hearings, Kirk said, everyone owning property within 1,500 feet of the boundary would be notified, and ads would be published in a newspaper. All interested residents can sign up for email blasts with updates on the project, he pointed out. No members of the public were present to address the commission on Sept. 11. 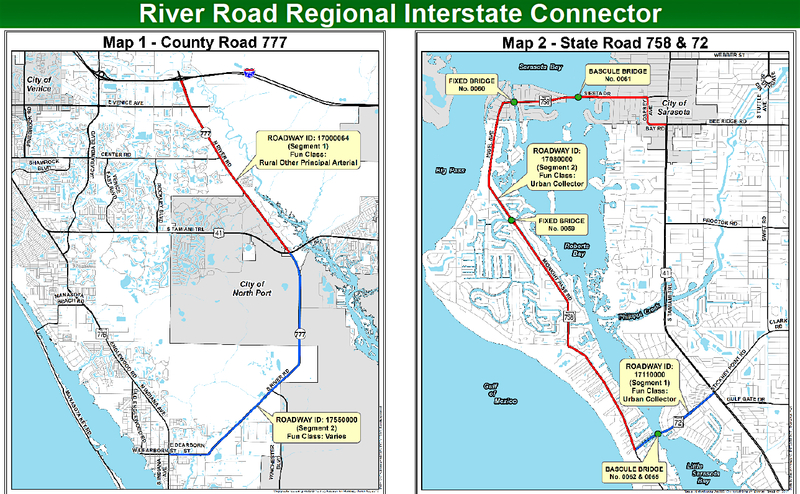 Sarasota County staff remains hopeful that it can conclude a road swap later this year that will give the Florida Department of Transportation authority over River Road north of U.S. 41. That would enable the state to prioritize the widening of that segment of the road to Interstate 75 — and other improvements — necessary for the road to become the major hurricane evacuation route that Sarasota and Charlotte county commissioners have envisioned. The widened road also would be of key import to the future residents of the West Villages and to Atlanta Braves fans, Sarasota County commissioners have pointed out. However, even if the swap proceeds as proposed, the county would remain responsible for improvements to South River Road, County Engineer Spencer Anderson has explained. That South River Road project may not be necessary, Black of the West Villages said during the Sept. 11 public hearing on the Winchester Ranch CAP application. “That may mean that we don’t need the full widening of River Road,” Black added. The other two roads will be able to move people through the West Villages north to the widened section of River Road from U.S. 41 to I-75, he said. It will be up to the county’s transportation planning personnel to decide how to proceed on South River Road, Black indicated.